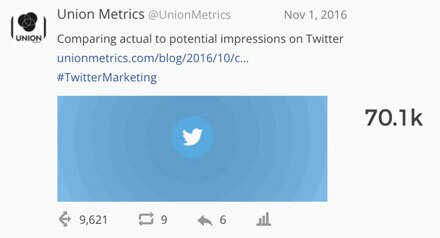 TweetReach Pro is now part of Union Metrics business plans. Monitor social posts across Twitter, Instagram and Facebook, all for the same low price. Get comprehensive, real-time analytics on reach, performance and engagement, and continuously analyze all posts about the topics you care about, displaying your results in eye-catching charts and digestible reports. Measure all the social activity that’s important to you – topics, profiles, hashtags, competitors. Never miss a posts. Our comprehensive Trackers are built on reliable, full-fidelity data access streams. Track posts about your topics in real time and watch as the conversation unfolds across Twitter. 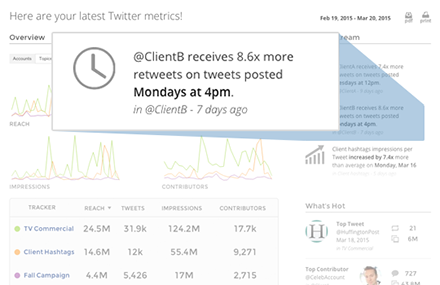 Get report-ready analytics to help you improve your content, engagement, reach and impact. Our system constantly monitors your social data for new trends and automatically generates insights based on the most important moments in your data. Our interactive Trackers are perfect for monitoring results in real time. Our beautiful reports are perfect for sharing with all your stakeholders. 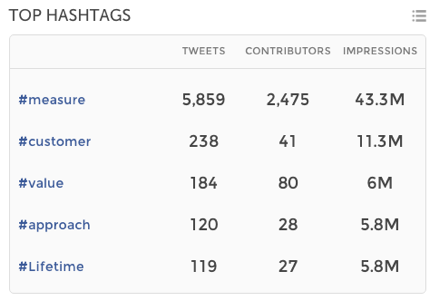 Monitor all the hashtags, keywords and topics that are important to you. Measure how large and how active the conversation around any topic is. 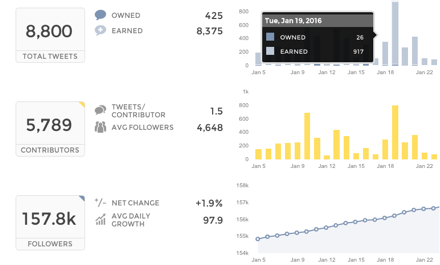 Learn about any account’s audience using our detailed profile reporting. Measure true engagement and follower growth over time. Measure how your content is performing, and see which posts, hashtags and URLs are resonating the most across social media. Learn what is working and what isn’t to help create better content. Ready to get started? Check out our plans. 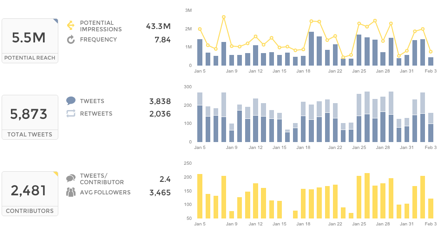 For in-depth analysis of all your real-time social data, Union Metrics business plans provide social media analytics on reach, engagement, influencers, content and so much more. Built on full-fidelity data, Union Metrics gives you the flexibility to analyze all the topics important to you. Whether you’re monitoring your brand’s ongoing presence or monitoring a campaign, we can help! Union Metrics subscriptions include 3 or more ongoing Trackers you can use for Twitter, Instagram or Facebook, including data archive and export, and myriad useful reports. Our simple setup means you can be up and running in just minutes. No-contract plans start at $49 per month. Interested in learning more about marketing across social media? With digital marketers in mind, we’ve compiled our favorite best practices for creating a smarter social strategy and improving your impact across channels. Learn more with our free ebook. 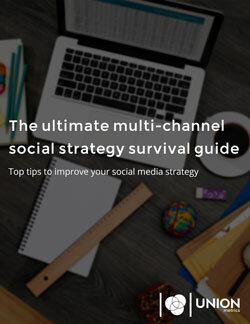 It’s chock full of tips on how to succeed on social media. Download it now!